Effective stockmanship is a concept and educational effort that is being promoted through the efforts of Ron Gill. A passion for improving the stockmanship skills of cattlemen across the country is the driving force behind this effort. Ron has been working with other stockmen and cattlemen's organizations over the past three years conducting trainings across the country and is currently helping to deliver the industry sponsored program stockmanship and stewardship. In addition to the Stockmanship and Stewardship program, Ron conducts stockmanship schools, demonstrations and training for producers, livestock markets, feedyards and organizations across the nation. For over 20 years Ron Gill has provided technical expertise in beef cattle nutrition, management and handling to livestock producers as livestock specialist for Texas AgriLife Extension. 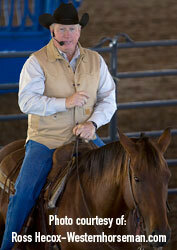 Ron is sought after as a presenter on numerous cattle related topics, not only in Texas, but across the nation. Much of his success as a presenter comes from his credibility as a rancher. Born and raised on West Texas ranches, Ron, his wife Debbie and brother Richard own and operate Gill Cattle Company a commercial cattle operation in North Central Texas. His interest in stockmanship has come from two different sources. Involvement in development and delivery of beef quality assurance education highlighted how stockmanship had a direct impact on beef quality and food safety. Service on advisory boards and working groups at the national level for organizations such as National Cattlemen’s Beef Association has magnified the urgency of adopting changes in livestock handling as animal welfare issues and the industry comes under more and more scrutiny by activist groups. Work to reduce sickness in high-risk cattle on his own ranching operation increased his desire to improve his own stockmanship skills. Changes in stockmanship allowed them to capture the economic benefits of improved livestock handling through reduced sickness, reduced labor and improved gains. Effective Stockmanship is based on handling cattle giving consideration to five basic principles of cattle behavior. If those simple behavior principles are the focus of your handling livestock, effective stockmanship can be achieved. In today’s harsh economic conditions and increasing scrutiny of the industry it is important to improve management skills that can improve performance and income without adding costs to the process. Stockmanship is one area in which this can be done to achieve improvements in animal welfare and performance. 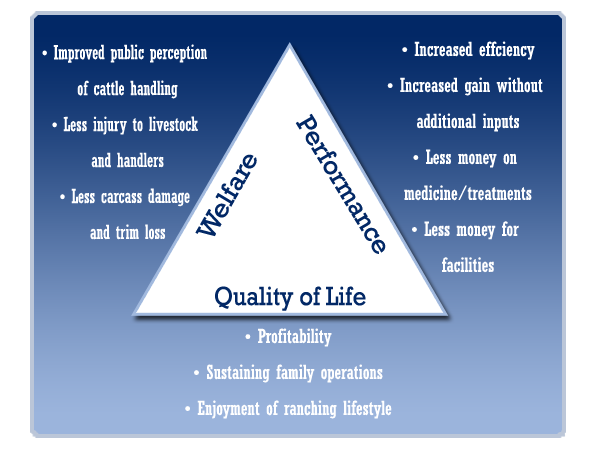 The great third benefit is the improvement in quality of life and sustainability of the ranching lifestyle. One good example of all of these behavioral principles is working cattle through a Bud Box. The following video demonstrates these five principles in practice. They are expressed in different order as listed above. As cattle enter the box they find they cannot continue moving forward so in order to remove that pressure they will start to turn around and as they do they will then be able to see the handler. At that point they will begin circling around you in the box and because they want to stay with and go to other cattle they will follow one another on to the truck. If given the opportunity cattle will be able to think their way out of the pressure they find themselves in. Effective Stockmanship will be working with NCBA and LMA in coordinating and conducting programs across the nation. These events are called Stockmanship and Stewardship. Thank you for your interest in Effective Stockmanship. If you would like more information on our program, please call us at 979-260-4046.